I specialise in search engine optimisation to help my clients websites rank at the top of Google for their chosen keywords. This increases targetted traffic to their site and in turn leads to more phonecalls from potential customers. To find out how my SEO services can help you, complete the form below. I am a freelance SEO consultant in Chester, Cheshire. I have been helping clients market their businesses online for over a decade using proved SEO techniques. If you aren’t investing in digital marketing in 2019, they you are already behind your competition. If you have come here looking for Chester SEO services, read on. SEO, or Search Engine Optimisation, is the practice of optimising a web site so that it ranks higher on search engines for a given keyword. It goes without saying that if your website appears at the top of Google results for the term ‘blue widgets’, then more people are going to click through to your website and thus, hopefully, buy more of your awesome blue widgets. Now the SEO industry has taken a few hits over the years due to people claiming to be SEO professionals, who are, for want of a better phrase, inexperienced chancers. Beware of bold claims of ‘hitting the #1 spot in 4 weeks’, people who don’t know what they are doing can do more harm than good to your site and ultimately get your site penalised by Google. This involves analysing your website and social media presence to make sure everything is 100% correct and working efficiently. Beware: everything may look okay to the casual user, but there could be underlying technical issues and inefficiencies that Google will be considering when ranking your website. I follow up the technical SEO with analysis on your top competitors in the search rankings for your target keywords. Competitors can be a goldmine data which can help with the next step (keyword research). By taking insight from your top competitors and applying them to your website, we can match (and even surpass) their success. One of the secrets to good SEO is identifying opportunities and exploiting them. By finding low competition keywords that tie in with your service offering, and using them as a focus for content marketing, I can help you achieve good rankings and thus deliver traffic (visitors) to your website. Arguably the most important step of the whole process. By taking the analysis gained from the previous steps, I produce content for your website that meets the needs of potential customers in some way and also meets Google’s exacting standards. Google will hopefully then reward us by giving the content good rankings for our chosen keywords, which in turn leads to more targeted visitors to your website. This is probably the most difficult step to get right. It’s also an area where many well-meaning SEO ‘professionals’ mess up and can cause more harm than good. I have seen countless websites with poor quality, ‘spammy’ links which have been penalised by Google. I only gain natural links to my clients websites, by producing great content that website owners want to link to. I only use white-hat techniques at every step of the way, which are fully endorsed by Google themselves. Shady blackhat and poor quality links may sometimes work for a short period, eventually your website can be manually reviewed by one of Google’s search quality raters. This can cause a website to lose it’s rankings overnight and it can be very difficult (and expensive) to recover from this. 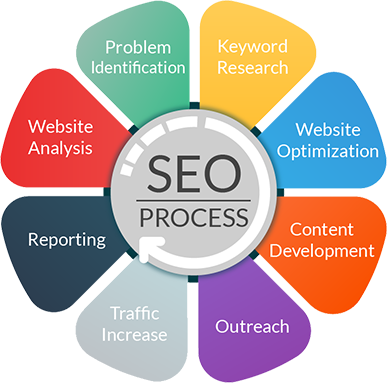 The below chart gives some idea of the various aspects of SEO. This is an over-simplification, a lot goes on within each of these areas, however this should give some idea of the top-level areas covered by my SEO service. I’m always happy to discuss your marketing strategy and offer advice on how you can improve your take your business to the next level online. Digital marketing is my passion and my career. Since I built my first website in the year 2000, I have been building websites and marketing them online. I have worked with many of the UK’s leading brands in a wide array of sectors from small plumbing companies to international brands. If you have a website and want customers, I can help you. Who is my deal client? I have worked with many businesses over the years from global brands to one-man accountants. During that time I have identified my ideal client profile, who for various reasons I have found to be a good fit. Has patience and understands the benefit of slow, steady, long-term growth. If that describes your business then give me a call, I’d love to help you succeed online! If you’d like to discuss more how I can help your business thrive in the digital world, feel free to contact me using the form below and I’ll call you right back!